New Delhi/Washington, April 4 (IANS) India on Tuesday snubbed the US’ offer to help de-escalate tensions with Pakistan, saying that its position on bilateral redressal of all issues between the two neighbours has not changed. It also said that the international community needs to address the issue of terrorism emanating from Pakistan. “Government’s position for bilateral redressal of all India-Pakistan issues in an environment free of terror and violence hasn’t changed,” Ministry of External Affairs spokesperson Gopal Baglay said. “We, of course, expect the international community and organisations to enforce international mechanisms and mandates concerning terrorism emanating from Pakistan, which continues to be the single biggest threat to peace and stability in our region and beyond,” he said. 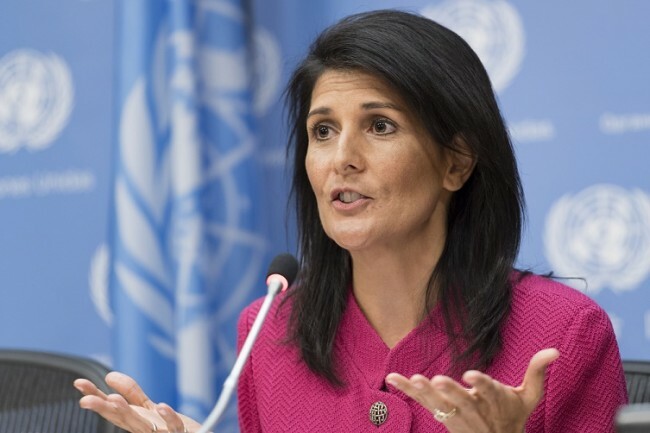 The reaction came after Nikki Haley, the US Permanent Representative to the UN, said on Monday that the US was concerned about the state of India-Pakistan relations and President Donald Trump himself might get involved in a peace process between the two South Asian antagonists. United Nations, April 4 (IANS) The US is concerned about the state of India-Pakistan relations and President Donald Trump himself may get involved in a peace process between the two South Asian antagonists, Nikki Haley, the US Permanent Representative to the UN said on Monday. “This administration is concerned about the relationship between India and Pakistan and very much wants to see how we de-escalate any sort of conflict going forward,” Haley, who holds a cabinet rank in the Trump administration, said. Her statement about India-Pakistan relations, therefore, assume importance and it is the first high-level Trump administration statement on India’s relations with Pakistan. “So, that will be something you will see, that is something that members of the National Security Council participate in,” she said.